lack of genotoxic and cytotoxic action. The TDM meshes are used in classic tension-free methods, such as, for example, the Lichtenstein surgery. Dallop® PP surgical meshes are sold sterile - EO sterilised in a validated process in acc. with PN-EN ISO 11135. As stated in EN ISO 10993-7, the mean dosage of EO for the patient should not exceed 0,1mg per day or 4mg during the first 24 hours. The level of EO residues in the surgical meshes introduced to the market is much below those criteria. The sterility of Dallop® PP surgical meshes is confirmed by sterility tests to which each lot of the meshes released for the market is subjected. The fact of being subjected to sterilisation process is proved by sterilisation indicators on the package. Dallop® PP surgical meshes fulfil the normative criteria described in PN-EN ISO 10993-1. The tapes possess a number of documented biological tests. Surface mass – between 60 and 80 g/m2 – ensures the patient's comfort of use. Burst strength – mean breaking load amounts to approx. 325 N – a few times more than natural force of muscle fascia. Dallop® PP meshes are packed in double medical package (in acc. 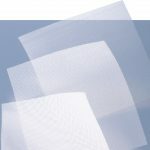 with the PN-EN ISO 11607-1) – paper-foil sleeve or bag; the package is adequate for EO sterilisation. On the outer package there is a TAG label (easy to peel of, self-adhesive, identifying the device). The double package enables introducing the product into the operating field with no damage to its asepsis. Moreover, the transparent package enables having a look into the package and inspecting the implant. A sterile implant packed into double medical package with IFU and additional double TAG label included is placed in a cardboard envelope. Such package ensures safe storage within the guaranteed validity period.